This is one of those creations you can add anything to and it will taste great. Serve as a main entree salad or as a side salad to burgers, chicken or fish. Having a pot of cooked quinoa in your fridge can be a fat and happy relief on those nights you arrive home late and don't have the energy to do more than toss a few ingredients together. It's good to enjoy the simple side of life from time to time. 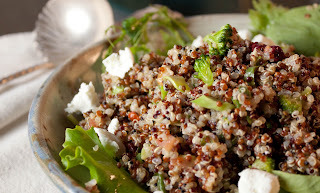 Fat and Happy Food Blog Tips and Techniques: Cook a pot of quinoa on Sunday and use as the base to various salads throughout the week. Cook the quinoa according to package directions. Make the dressing in the meantime by whisking all the ingredients in a bowl large enough to hold the final salad. Cut the vegetables, the broccoli, onion, avocado and tomato and toss with the dressing. Once the quinoa is done, cool slightly then toss with the dressing.Toss in the walnuts, sesame seeds, dried cherries and goat cheese. 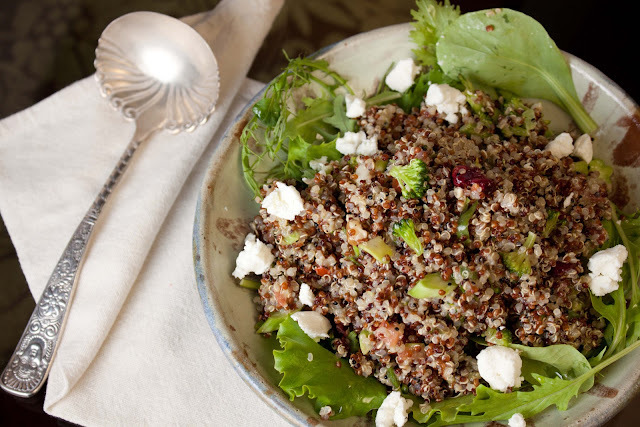 If you precooked the quinoa, simply toss with the ingredients or warm slight before tossing. Serve on a plate of field greens. Can be served warm, room temperature or as a chilled salad.